The National Organization for Women Political Action Committee endorses the Democratic presidential ticket of Barack Obama and Joe Biden in September. According to Illinois Department of Employment Security, the average income of women in the Chicago metro area was about 60 percent of that of their male counterparts. Women earned $2,969 a month on average for the latest year available ending in the third quarter in 2007–”about $2,051 less than men’s average. 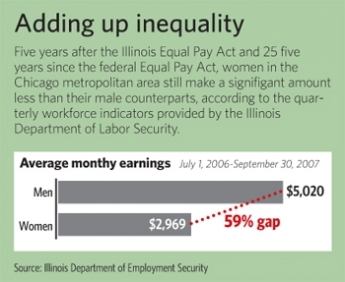 Ten years ago, Illinois women were making slightly less–”about 56 percent of men’s wages. “In the same industry and in same jobs, males are paid more, and more females are employed in lower wage jobs,” said Richard Kaye, a labor market economist for the Illinois Department of Employment Security. Since the Illinois Equal Pay Act was passed in 2003, there have been 349 complaints filed with the Illinois Department of Labor, which investigates allegations of pay disparity. Since January, more than $19,000 has been paid to employees as a result of the labor department’s enforcement of the act. According to the WAGE Project, a Massachusettsbased nonprofit that works to end discrimination against women, the income disparity results in an average lifetime loss of $700,000 for those with a high school diploma. Female college graduates will make $1.2 million less than their male counterparts.